In Jinky Coronado’s first volume of BANZAI GIRL, readers got to meet Jinky’s character and her family, and experience her adventures dealing with an alien invasion and (of course!) Filipino monsters of myth… all the while battling homework and schoolboys! Now, in this second volume, Jinky and Michelle are touring the world to promote the release of their BANZAI GIRLS Music CD (that’s a real thing, folks!). They come home to face a fearsome collection of even more dangerous mythic monsters: The Kapre`! The Duwende! The Manananggal! The Tikbalang! But that’s not all — Jinky has a new sister! If you’ve been following BANZAI GIRL through the newer adventures published by Arcana and later featured as a webcomic on Keenspot.com, you’re in for a real treat. Why? 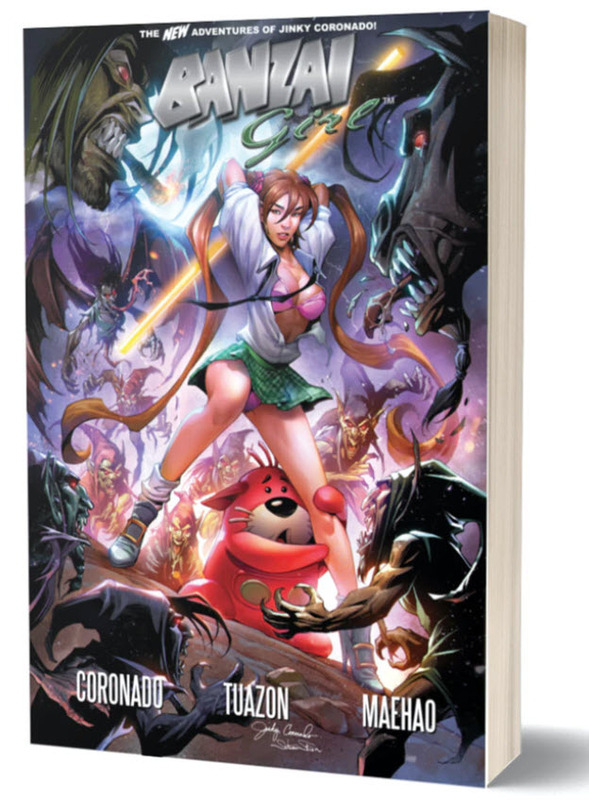 Because the greatest part is yet to come — in addition to material never before collected, this graphic novel boasts an ALL-NEW story that’s never been in print and never shown online, because they JUST FINISHED IT! Larry Tuazon, Katrina Mae Hao, and Jinky Coronado have been working on this book for 10 years!! After a scientist dies from a robotic rampage, his daughter blames Jinky’s father for the terrible tragedy — and she seeks revenge on Jinky’s entire family as well as her friends! It’s the biggest, baddest, scariest story I ever wrote — and certainly the best drawn. Here, have a look at some of Larry’s and Jinky’s sequential art pages, with Katrina’s wonderful coloring and check Kickstarter for all the options!